G.A. Murdock has spent many years developing new products for the water conditioning industry to help solve common problems encountered by installers. We have engineered our products with a focus on ease of installation, compatibility and durability for use with appliances, RO Systems and medical devices. All Mur-lok products are manufactured and assembled in the U.S.A. at our factory in Madison, South Dakota. In recent years we have expanded our production capabilities to include more injection molding machines, automated robotic systems and standardized processes to handle an even broader range of customer-specified tooling and kitting projects. Mur-lok fittings, tubing and valves are a great fit if you are looking for U.S. made products to help in re-shoring projects, looking to avoid potential international import tariffs by buying Made in America products, or seeking to meet "Buy American" purchasing requirements. We are proud to extrude, mold, assemble, package and ship our items from South Dakota according to the required specifications of many American and international companies. We also maintain compliance data for our materials and resale products for meeting reporting regulations such as: RoHS, REACH, NAFTA, Conflict Materials, Lead Free, California Proposition 65, toxicity and more. Please take some time to browse the Mur-lok products available and contact us if you are interested in pricing, specifications, or customized solutions. 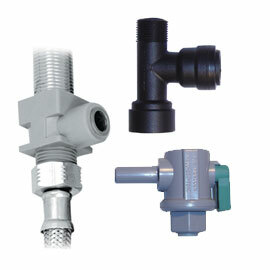 Learn more about our standard fitting material options and kit/packaging options.